At EmergencyKits.com we understand that you have choices on where to buy your emergency preparedness supplies which is why we work hard to earn your confidence and trust. The quality of our products, responsive customer service, everyday rock bottom prices, and no-gimmicks approach is reflected in our A+ rating with the Better Business Bureau. In choosing EmergencyKits.com you can be confident that we will work hard for you. You will not be disappointed! In addition to our everyday low prices, we offer additional discounts on products when purchased in larger quantities. Quantity discounts are displayed on the product detail pages and are automatically applied in the shopping cart. QUOTES: If you need a formal quote from Emergencykits.com, don’t hesitate to contact us by email at Sales@EmergencyKits.com or call us at (800) 270-2889. Our experts will respond right away. 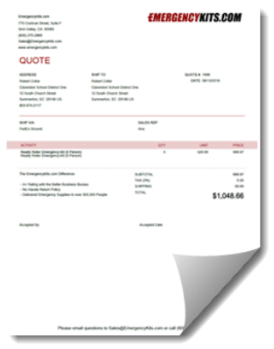 Our comprehensive quotes include: pricing, shipping costs, sales tax (when applicable), and payment terms. RFPs AND RFQs: If you would like us to respond to a RFQ or RFP, please send us an email and let us know where your requirements are posted. We will have one of our experts evaluate the requirements and respond to the RFP or RPQ. If your organization or company needs Custom Emergency Kits, then you’ve come to the right place! At EmergencyKits.com our emergency preparedness experts and designers can build an emergency kit to meet your exact needs and specifications. Whether you simply need a logo printed on one of our existing emergency kits, or you need a new kit designed and equipped from the ground up, EmergencyKits.com will deliver! Don’t hesitate to contact us by email at Sales@EmergencyKits.com, or call us at (800) 270-2889. We have expert representatives ready to assist you. The process is fast, easy and more affordable than you may think. Choosing the right kind of emergency supplies for a friend or family member can be difficult when you may not know their specific needs which why a gift card from EmergencyKits.com makes for the perfect gift. At EmergencyKits we provide you with information about disasters. Preparing for an emergency is an essential step in keeping your family members safe when disaster strikes. At EmergencyKits we provide you with forms and documents that will help you stay in the know about what to do when experiencing an emergency situation. At EmergencyKits.com we offer a wide selection of professionally designed emergency kits to meet your specific needs. Our emergency kits (sometimes referred to as Go Bags, disaster kits, and survival kits) contain essential supplies designed to sustain and save lives and provide comfort when disaster strikes. At EmergencyKits.com we have emergency kits specifically designed to support individuals and families, schools, businesses, government organizations, first responders, and the military. For companies and organizations with specific needs, our experts can design custom emergency kits to meet exact specifications. We can even include custom logos and labels. Our high-quality products, unmatched customer service, everyday low prices, and no-gimmicks approach, set us apart. As a result, we have earned an A+ rating from the Better Business Bureau for 6 consecutive years.